Make your very own chocolate bar! With unique flavors such as caramelized ginger and spicy chipotle pepper, you can create your own work of art! 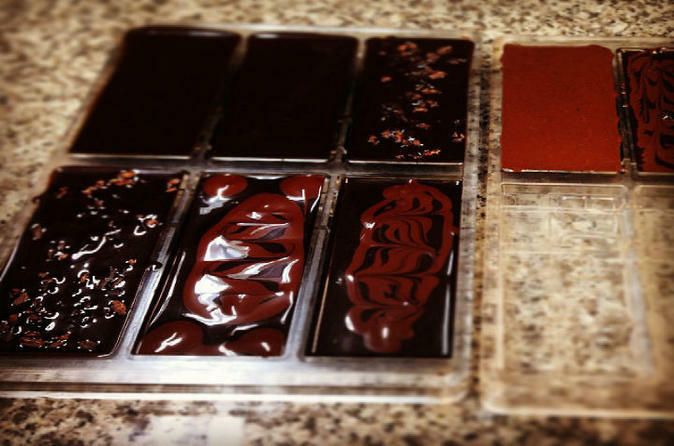 Learn how chocolate is made bean to bar in this informative tour. Learn about the origins of chocolate and how it is made bean-to-bar in Hawai‘i by tasting it in 3 forms: the delicious lychee-tasting fruit juice of cacao, a fresh roasted cacao bean and a flight of 5 of our most popular chocolate flavors. Finally, make your very own chocolate bar using Hawai‘i grown and made chocolate, choosing from a delicious selection of fruits, nuts and spices to flavor your bar, from toasted coconut to spicy chipotle pepper or Hawaiian sea salt. Finally, you will get to try Oahu’s award-winning chocolate and see how we make it, in this delicious and informative tour!